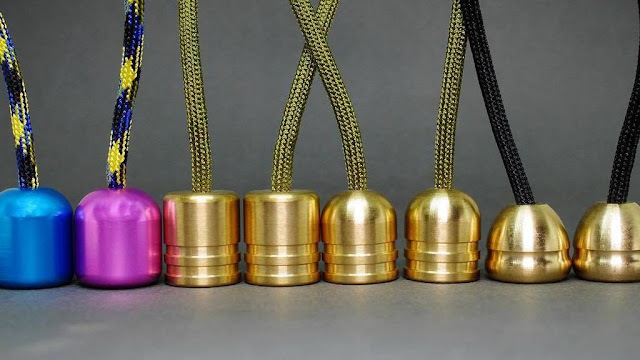 A playable set of begleri can be made from a wide range of materials, in an assortment of shapes and sizes. Traditional begleri from Greece are often made from semi-precious stones, or materials such as animal bone or horn, which can be carved. However, these materials tend to be somewhat delicate and do not stand up well to hard play. The most common modern begleri in Greece, are made from small cylindrical metal beads, often aluminum, which are partially hollowed or recessed, which encloses the knot. You can also make a begleri yourself by stringing a handful of hex nuts (usually two to six, depending on the size and weight) together on a piece of paracord or braided string. Metal beads tend to be preferred due to their weight and durability. While the size, shape, and weight of begleri are generally a player preference, most sets tend to be within a conventional range of shapes (round or partially rounded without significant protrusions), sizes (generally from 15mm to 25mm in diameter), and weights (generally between 10g and 20g per bead). Beads outside of these ranges may be awkward for average players to handle. Light materials such as most plastics and woods can be used to make begleri, but are often given a metal core, since they are too light for the preference of many players on their own. String length is a personal preference, and begleri players use a variety of lengths. However, different lengths of string tend to make certain tricks, transitions, or styles of play either easier or harder because of the amount of string required to wrap around the fingers, or to span the with of different numbers of fingers. Some tricks may be impossible with a string that is too long or too short. There appear to be two emerging "standards" in string length, which players have been referring to as the "short game" and the "long game". Historically, the longer version of begleri was very popular in Greece during the 1960s; however, these were outlawed as potentially dangerous during the military junta of 1967-1974, and subsequently, the shorter version of play became popularized. Short game: The shorter of the two common string lengths is measured against the width of the hand, with most players preferring a string length of about 2cm wider than their hand width. The short game is associated with quick tricks where the begleri snap between positions. Long game: The longer of the two common string lengths is measured against the span of the fingers, roughly corresponding to the distance between the tip of the index finger and the tip of the pinkie finger if the fingers are spread wide. The long game is associated with tricks that involve partially wrapping the string around the fingers during play. The begleri can be held in a variety of ways. In general, the begleri is held between fingers, usually between the first and second knuckles (rather than towards the base of the fingers), as this provides more range of motion during tricks.